I’m not really referring to a mental condition or an emotion with my title…it’s more specifically “Mad Men” the T.V.show, that is, or even more precisely “mad” for a crazy “disco era” color scheme! Yes! 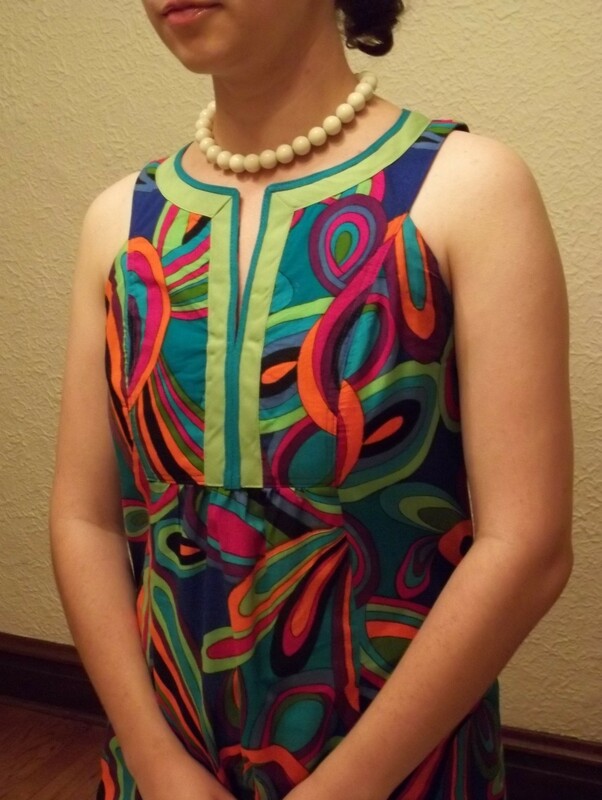 This “Mad Men” inspired late 60s dress of mine is my ultimate summer party dress for this year. (Click here to see the blog of my ultimate summer party dress for last year!) 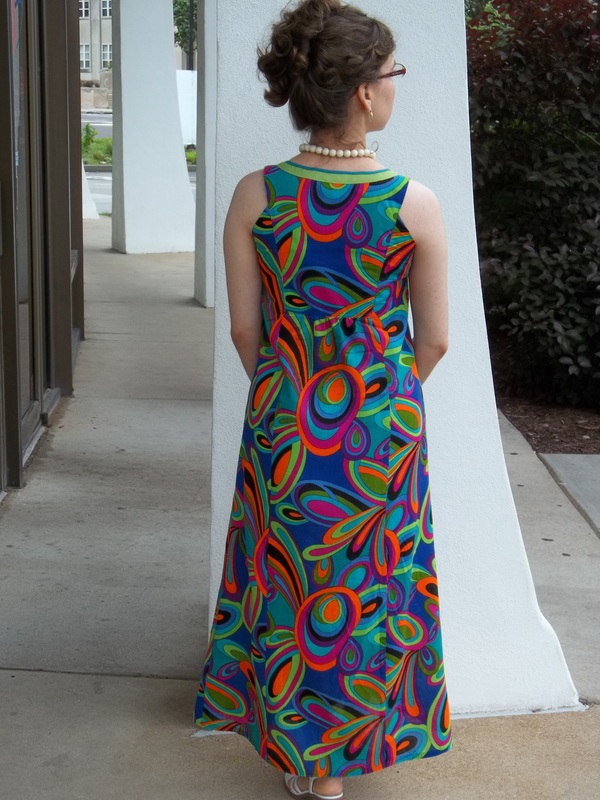 Like last year’s party creation, this “Mad Men” 60s inspired maxi dress was different and out of my comfort level, but, as always, stretching my boundaries gives me a new sewing satisfaction, especially when I end up with a new favorite item to wear. 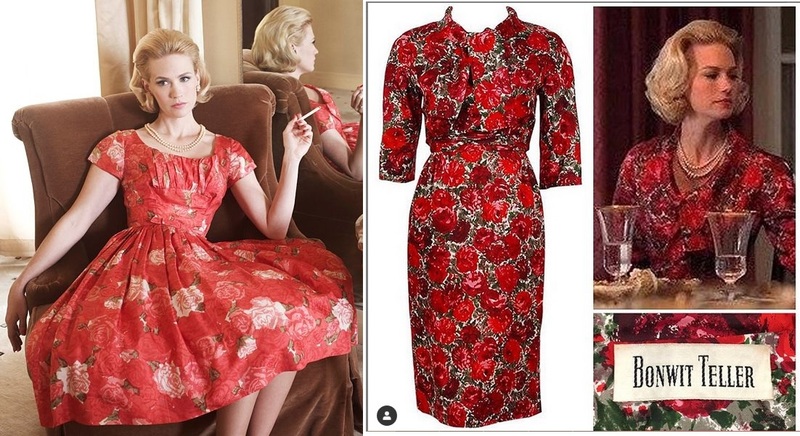 A very lucky find of an old fabric stash at a vintage fair provided me with the opportunity to make my copycat version of this lovely Pucci designed dress worn by the “Mad Men” character Betty (see left picture). This scene can be found in Season #3, the “Souvenir” episode, released November 30, 2010. 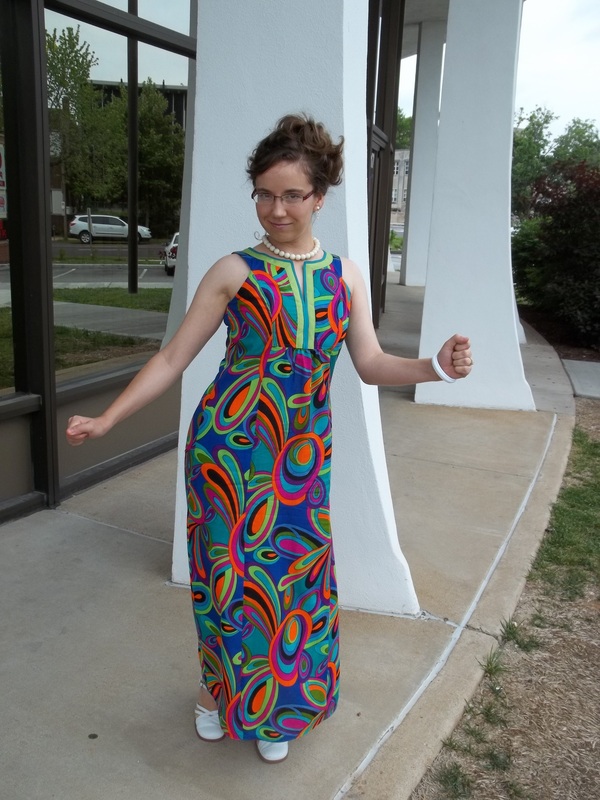 I can’t help but do a funky dance in my wild retro dress! We even found an era-appropriate “Mid-century modern” building to have as the backdrop for the picture below (more about this location later). FABRIC: I believe it’s a cotton/polyester blend fabric, soft and flowing, in a wild “Pucci style” color tone of swirling, bright (almost neon) colors. The fabric was vintage, but not that old to be a poly blend, and it was a 3 1/2 yard cut in a 45″ width. 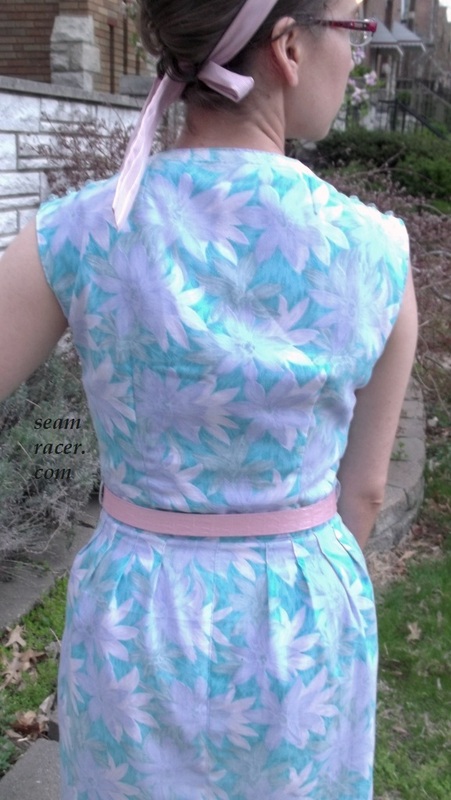 I also used an old, small scrap of fabric in a matching blue to use for the dress’ side pockets. NOTIONS: On account of all the colors in the fabric, I had multiple choices when it came to deciding what color thread to sew my dress together. Therefore, I had thread on hand already – I used a deep turquoise thread which was also used to sew up my “Serpentine Style” 1948 dress. 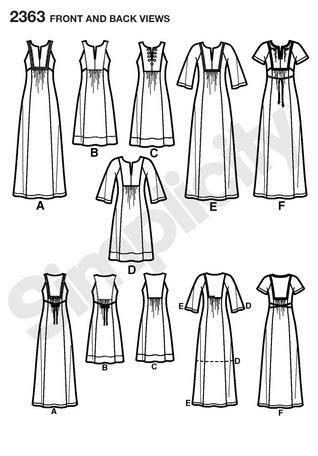 The only notion I needed also happened to be hardest to pick out – something to create the contrast trim along the dress’ neck line edge. I will talk more about this further down, but, in the end, I ended up with 1 pack each of two different colored bias tapes. TIME TO COMPLETE: From start to finish, my late 60’s maxi dress took close to 10 hours (maybe a bit more, maybe, or a bit less, perhaps) on May 17, 2014. It was finished just in time for an upcoming outdoor birthday party for our little one. THE INSIDES: My dress’ innards are quite nice but not perfectly clean, which I’m o.k. with anyway. All the long panels (three in front, three in back) took some time to sew together, so I merely double zig zagged the raw edges and trimmed any fray threads. The ‘bib’ facing sections of the front and back necklines cover up all the bodice seams and most of the armhole seams, so the top half of my dress is smooth and nice inside. The bottom hem is finished with matching turquoise single fold bias tape. See the below picture. TOTAL COST: The vintage crazy colored fabric roll was $7.50, and the bias tapes were just under $2.00 each, so my total cost is about $12.00. Just in case you don’t know, “Pucci style” prints are as wild and lively as his life story. Emilio Pucci’s designs are also unmistakably iconic of a past era – the 1960’s. The designs of “The Prince of Prints” were worn by everyone who was someone in the 60s, from Jackie Kennedy to Sophia Loren to Marilyn Monroe (who was buried in a Pucci dress). “As the sixties swirled on, Pucci draped his devotees in increasingly vivid prints, using a kaleidoscope as a guide to color his Op-Art arabesque, filigree, and mosaic motifs in stylized Art Nouveau and geometric patterns”, to quote “Vogue.com”. “The psychedelic profusion that defined the era (of the 60s) would fall out of favor, however, elbowed aside by the disco-casual of the seventies and then the man-tailoring of the power suit eighties. The unmistakable Pucci print, all swirls and whorls, did have a brief moment back in the sun around 1990, when the retro impulses of the nightclub scene collided with a passion for all things bright and colorful.” (Another quote from “Vogue.com”) However, out of all his trendsetting creations, such as his trademark silk scarf, none would give him a name to fame quite like his featherweight silk jersey dresses. “A Pucci dress is just about worth its weight in gold,” observed The New York Times in 1967. 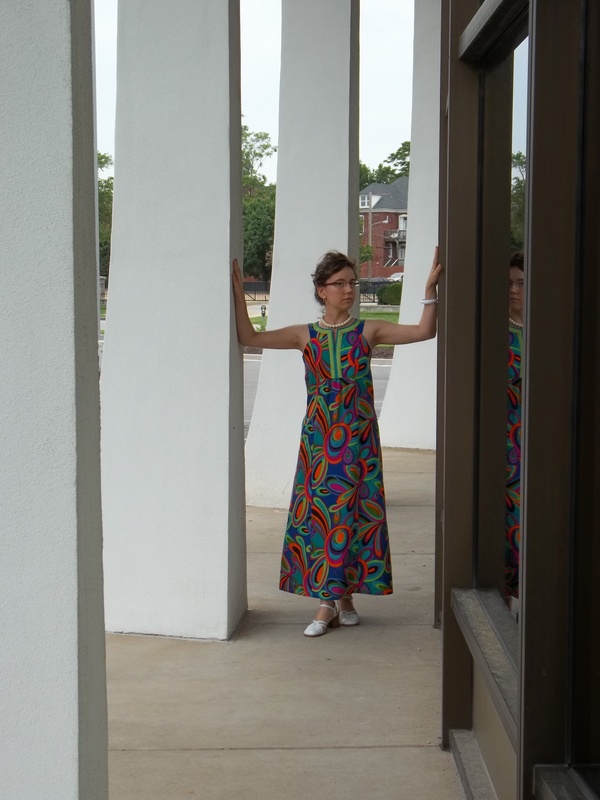 The “Mad Men” episode in which Betty wore her Pucci dress took place around the time of Dr. Martin Luther King’s assassination, dating her dress to circa 1968. 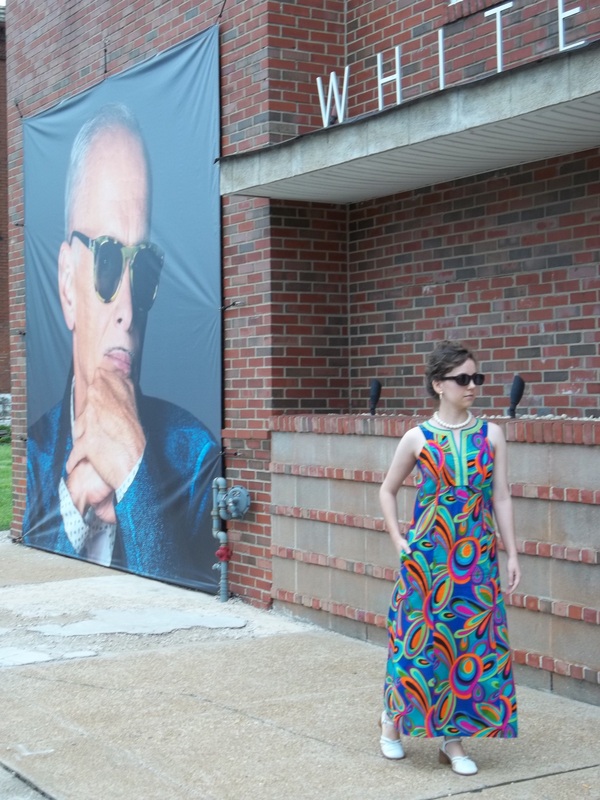 My own Pucci knock off creation may not be an authentic print, nor is it a fine silk jersey, but I feel that my “Mad Men” copycat maxi dress captures a definite, exciting moment in the history of the fashion world. 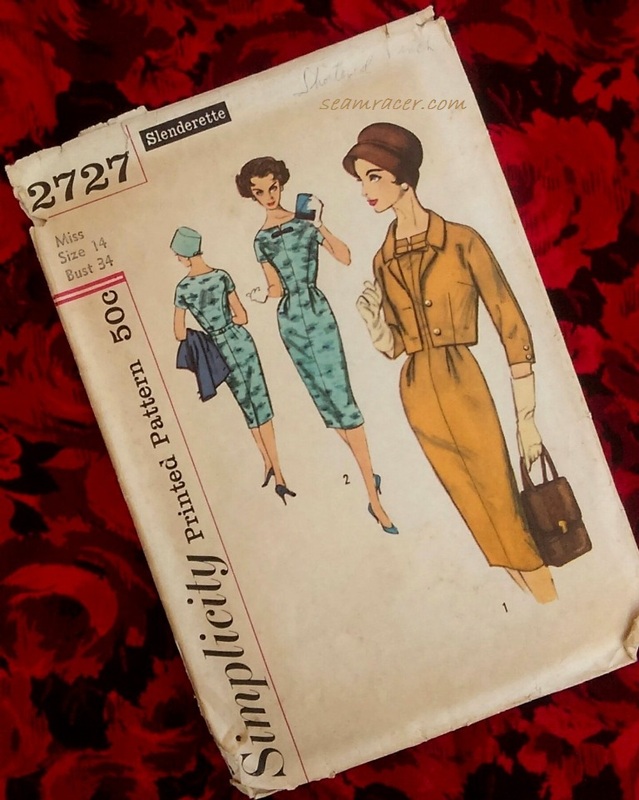 For the styling of my retro dress, I chose this modern Simplicity 2363 pattern because (to me) it married the best of everything together. 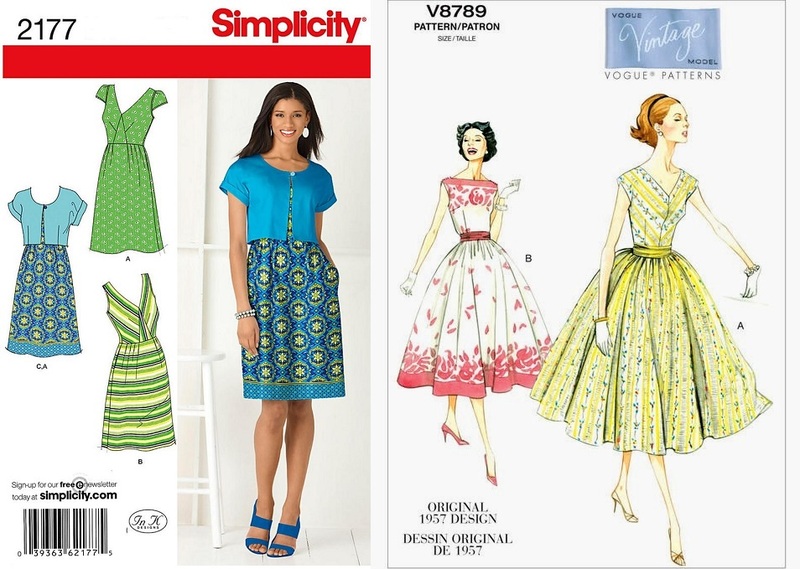 Simplicity 2363 is quite close to Betty’s original “Mad Men” Pucci dress, having the empire waist and split front neck, with a styling which appeals to my personal taste, while still staying true to authentic styling of the era. I really couldn’t sacrifice keeping exactly similar to the T.V. show dress, because I really didn’t like the full gathered high waist. Betty had just had a baby a few episodes before she is seen wearing the dress I used as my inspiration, so I can understand the waist styling somewhat, but Simplicity 2363 cut back on a full waist by having gathers at the center front and center back only. 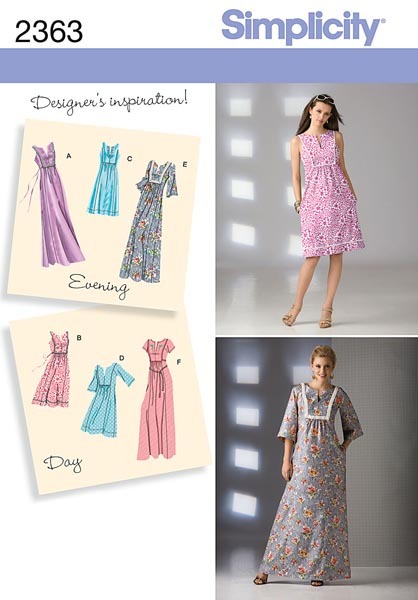 After my dress was finished, I happened to come across the envelope cover of a vintage 1970 Simplicity 8025 pattern (seen at left) which proves the validity of my idea that the “bib” design of the modern Simplicity 2363 is a retro design element. 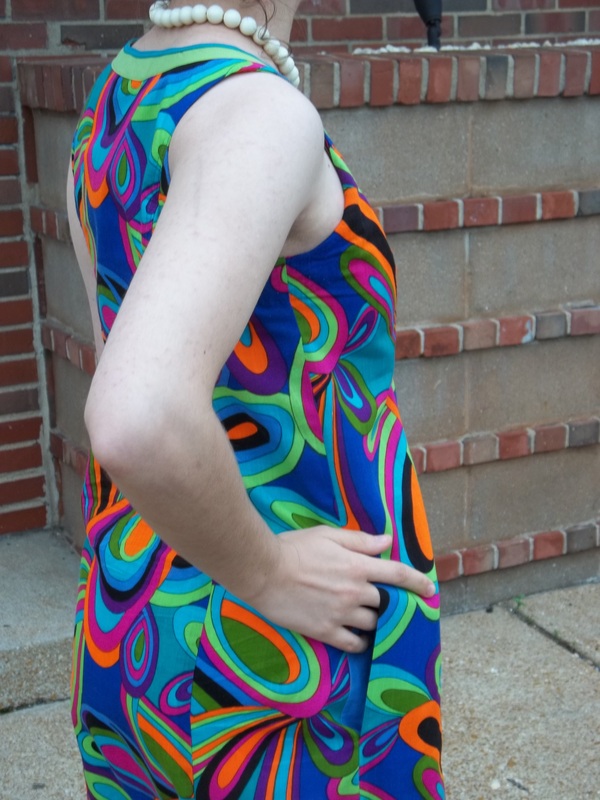 With my Pucci knock-off dress being a circa 1968 dress, imitating the 1970 look is not far off…merely fashion forward. 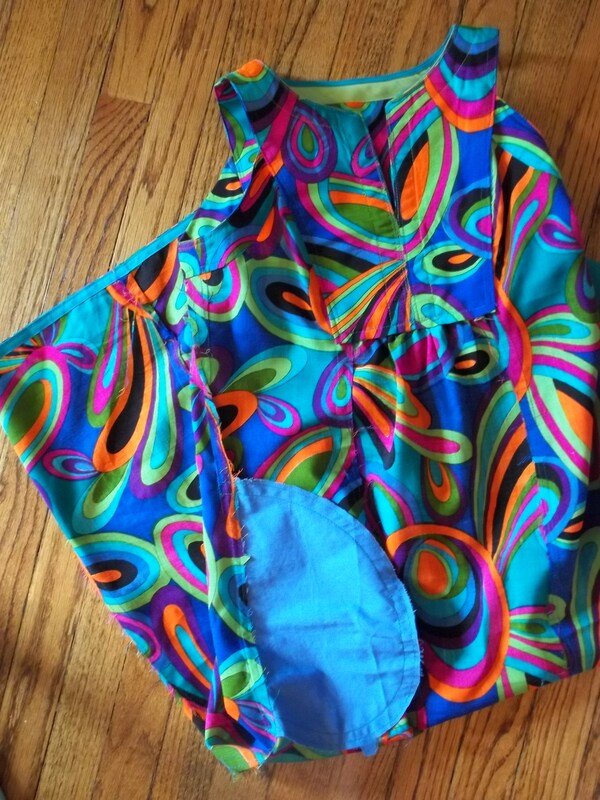 This is my fourth 1968 sewing project (numbers 1, 2, and 3 can be seen by clicking here). After browsing through plenty of reviews of Simplicity 2363 on the blogging-world, I was thoroughly confused as to whether or not this pattern really normal, small or generously sized. I ended up cutting out according to what saw on the finished garment measurements, grading just a bit to cut out a size smaller than normal for my bust, while keeping my normal sizing for the waist and hips area. As my dress turned out, the sizing I chose was a perfect fit. The only minor change that I made to the fit and sizing of my dress was to bring in the side seam (the one in the center of the side panels) 1/2 an inch on each side for a total of an extra inch smaller. I graded the 1/2 inch down to the normal seam allowance (5/8 in.) by the time I got close to the pockets, and remembered to take in the side panel’s under arm facing, too. I could have done without taking the side in an inch, but my dress is not bad with it, because there is not any underarm gaping…I just need to do a bit more of a wiggle and stretch trick to get it on! 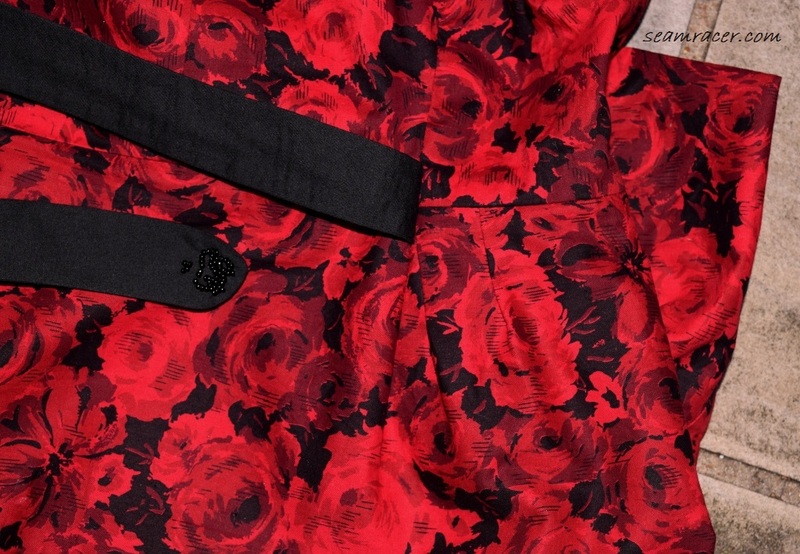 The pockets in the side seams are a wonderful dream come true! I never realized how handy and fun pockets could be or how easily they are to sew in. I am impressed at how the pockets are absolutely invisible by having them recessed in by 1/4 inch. It’s embarrassing to admit, but having my dress’ pockets face in towards the center front makes me kind of think of myself as a kangaroo, with space to store stuff over my belly! 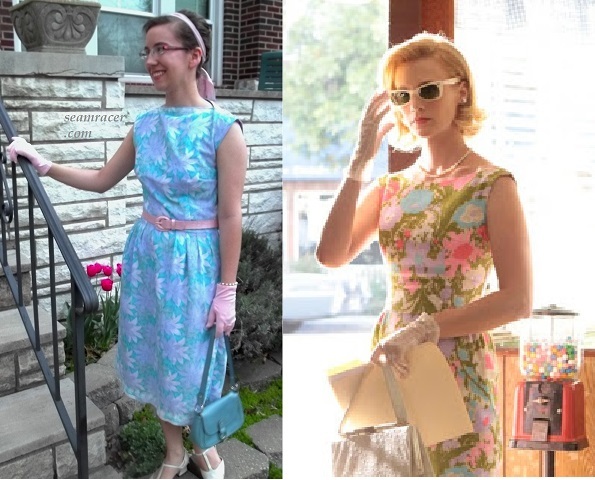 The two-tone color trim around the neck and bodice was the most challenging part to recreate to make my dress similar enough to Betty’s original. I did a good amount of brain crunching to figure out 1.) how to shape something around the neck and bodice, 2.) what matching colors to choose and 3.) where to put the trim. 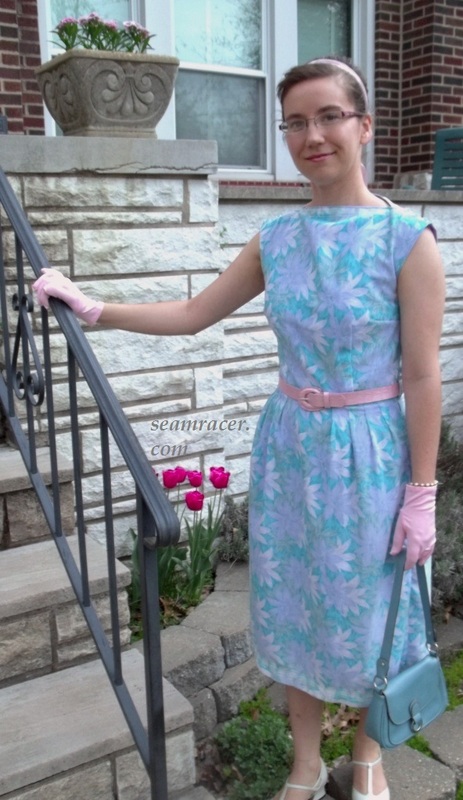 Like what I did for choosing the pattern for my dress, I found a compromise between following Betty’s dress and staying true to my personal taste when it came to the trim. The helpful employees at my local Hancock Fabrics store were again an amazing help…they gave me the idea to use packaged bias tape for the trim. I had been thinking of using ribbon or making my own “facing”, but bias tape, being on the bias, stretched and curved and was easily ironed into place just like they said. Using packaged bias tape was a good thing also by the way I was restricted to the colors available, because otherwise I had no idea what colors to hone in on in the fabrics print. I went for the more muted colors of turquoise and lime green to mellow things out. I used a double fold for the lime green bias tape (so it wouldn’t show the print underneath), with the inner points mitered in for a neat corner. The turquoise bias tape is a small single fold which I folded in on itself to make it thicker and smaller. It took some meticulous machine stitching to hover on the very edges of the bias tapes and sew the bias tape down just how I wanted. I love how it looks! While sewing my dress together, I wanted to get “in the mood”, so I put on some disco-era and 60’s style music. I mostly listened into a favorite CD of mine, “The Way I See It” by Raphael Saadiq. My favorite songs are Love That Girl, Keep Marchin’ , Staying in Love, and Sometimes (the last of which I included in my title). Saadiq’s soundtrack kept me going through my sewing, and his songs are stuck in my head so I can listen to them again (whether I want to or not) every time I wear my “Mad Men” look-alike dress. It’s no wonder I was dancing in the picture at the top of this blog. Happily, as I mentioned at the beginning of my blog, the backdrop to my dancing picture is also very complimentary time-wise to my dress, as well. 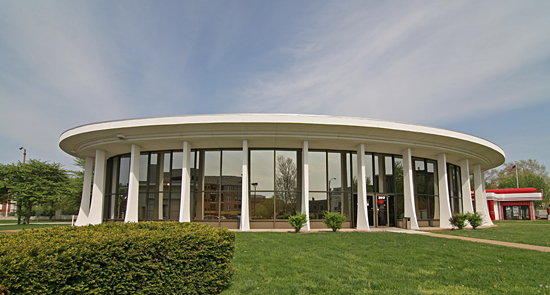 It is the American Automobile Association (AAA) office building, 3915 Lindell Boulevard, completed in 1977 and designed by W.A. Sarmiento (see right picture). Wenceslao Sarmiento, a Peruvian-born American modernist architect who was the head designer (1951 to 1961) for the Bank Building Corporation of America, designed many amazing financial buildings across America but especially left a powerful example of “Mid-century modern” style in my town with the AAA office. My town, St. Louis, is extremely rich with “Mid-century modern” buildings of every purpose, with our town’s very best headliner for the style being Lambert International Airport. In my opinion, few of the “Mid-century modern” buildings are as perfect an example of the style as the AAA office, with its walls made of glass, ‘post and beam’ design, and suburban modernism. I know this style isn’t for everyone. However, it is an architectural and historical style of many famous artists (like Frank Lloyd Wright) whose buildings are in dire need of respect. Our town even has a handful of groups, such as “B.E.L.T. STL”, “ilovebernoudy.com”, and especially “Modern STL, who are actively involved in the preservation and awareness of the modern styles. “Mid-century modern” buildings are quickly starting to completely disappear before they even have a chance to be recognized. I’m sorry for the passion here, but it seems as if it is too easy to demolish something that’s one-of-a-kind, unable to be recreated. Art is as individual and special as the people that make it. 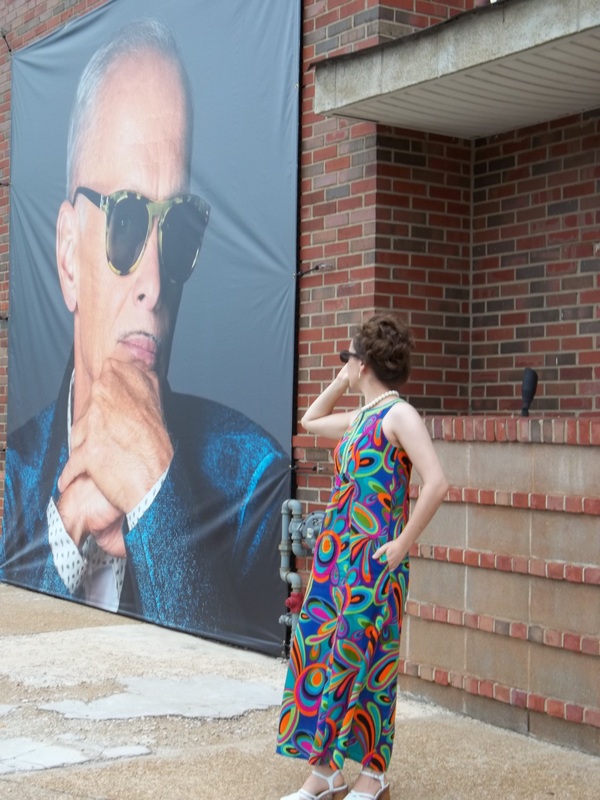 Speaking of art, hubby couldn’t help but notice how my maxi 60s style dress even turns heads, like on this poster in front of a neighborhood art gallery. Thanks for joining me joining me on this trip through the late 60s fashion and architecture. 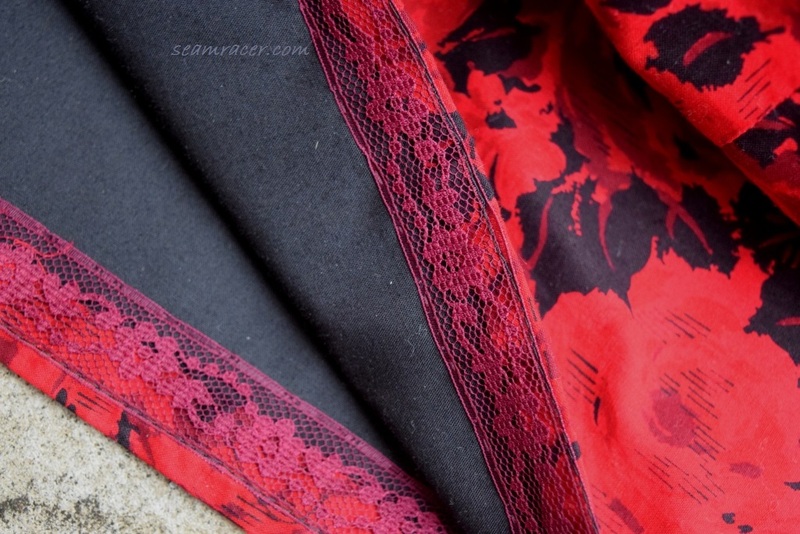 I hope this post inspires you to explore outside your sewing comfort zone…and enjoy it! As an idea, get out into your city and find out if there’s some “Mid-century modern” buildings to see for yourself! Please check my Flickr page, Seam Racer, for more detail shots and fun outtakes. My floral border print dress makes me feel a part of the “Mad Men” TV series and Audrey Hepburn era, with all the classy fashion that goes with these connotations. I am especially proud at how I made the most of what I had with this dress. It is a ‘franken-patterned’ creation so as to make the most of a small amount of border design fabric from my stash. 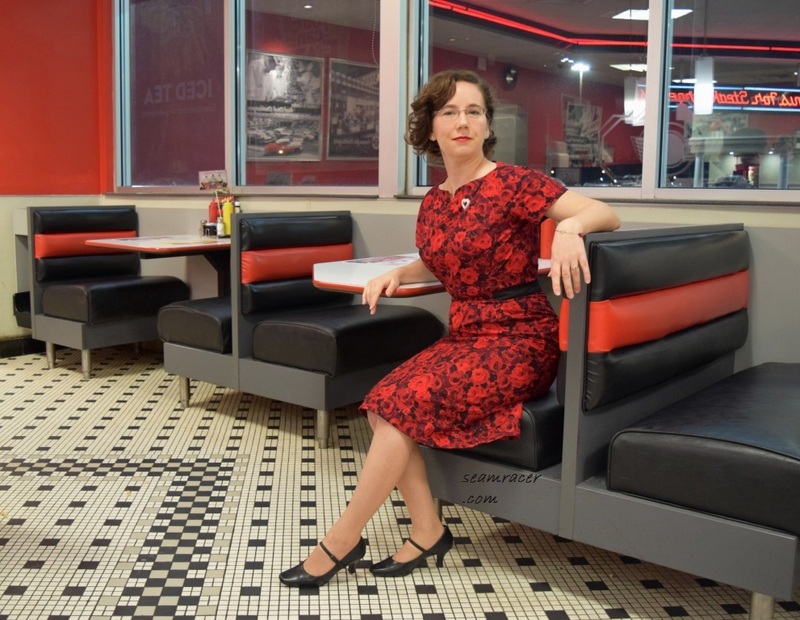 This pattern combo also makes a more manageable design to wear in our modern times while still remaining true to 1957 dresses. I am very happy with how all my meticulous work paid off these past two years I’ve been dressmaking to have this project turn out just right – finally! FABRIC: a lightweight rayon (super soft with a slight mesh weave),with a stitched on border print, in only 2 yards…it’s been in my stash for so long I’m considering it free; lavender cotton batiste for the dress’ lining, bought 1 3/4 yards for about $4 – the handful of scraps leftover of the lining fabric went to my “Heart Apron”..click here to see how I used them. TIME TO COMPLETE: first finished on July 28, 2012, after more than 10 hours of work; then several more hours of alterations and final work was put into this dress in April 2013…yep, a two year project! 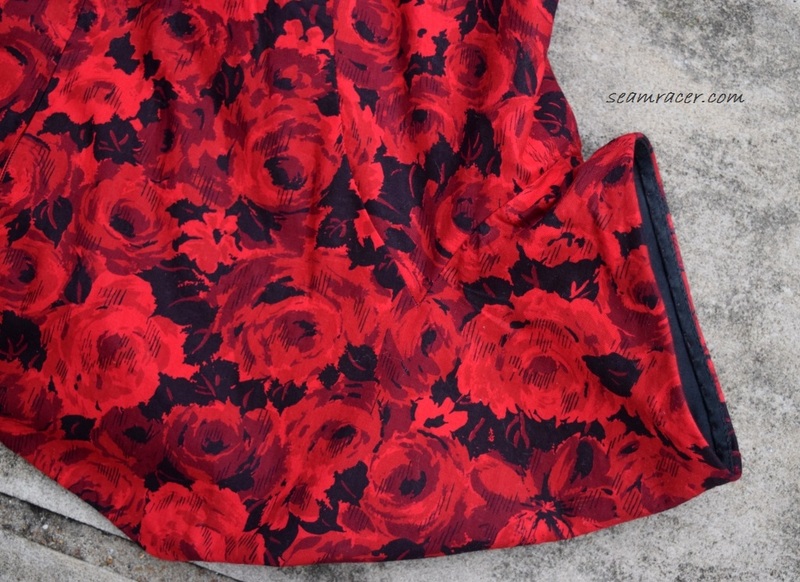 The reason why I think this project was chosen next was twofold: the fabric was so pretty and soft I would rather wear it than fold it and put it away, and also because I wanted an adventuresome project to further test my sewing skills. I made a mistake – but small enough to recover – when I was cutting. Mistakes are something I rarely do at the cutting stage because I know they waste fabric and can doom a project. They are avoided at all cost! I was doing my usual grading between the bust, waist, and hips while busy talking and thinking, when I realized I really only cut the front bodice in my bust size, which is too small for my waist. Apparently talking and cutting do not intermingle well. However, hubby thought of cutting the back with the extra width missing from the front piece. This worked out great, but with only 2 yards to work with, this fix had to work…I didn’t have another fold to cut on! All the darts in the bodice and the tucks in the skirt’s waist were (as usual for me) the most bother, especially since I was actually making two dresses, one for the lining and one as the ‘good’ dress. Once I got past that part the rest of the dress went together quickly. I hand sewed the cording loops for the buttons onto the front shoulder seams, then the lining and the ‘good’ dress were sewn together at the neck and shoulders, and the whole thing turned right sides out. My neck and shoulder seams were all top-stitched down for reinforcement. Wow! Once I reached this point I was really impressed with the way the dress laid down nicely and the darts matched up almost perfectly with the waist tucks. I had planned my dress with the zipper to be installed between the left side seam, differing from the Simplicity 2177 pattern. 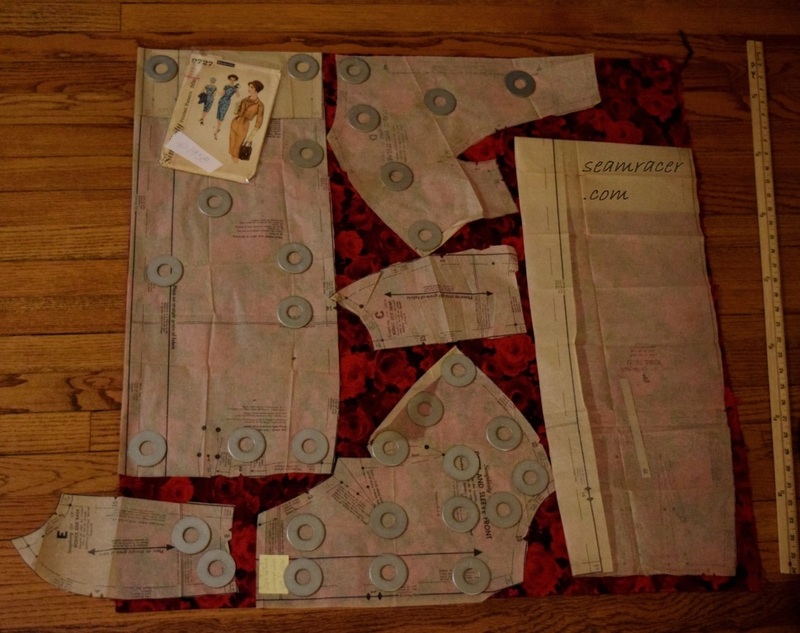 This plan makes for a LOT less wiggling and contortions to get into this vintage dress. When I sewed in the zipper the first time, I did a so-so job, since the teeth were showing too much with not enough fabric overlapping. I wanted to fix it then, but this year I had the perfect excuse to unpick the zip and do it right as I needed to take in both sides several inches due to some weight loss. Now I can say my dress looks professional. The buttons were an unexpected happy match in the frosted mint green. Hubby found them for me…two heads are better than one! Nevertheless, this year I ended up sewing the button loops down, making them more or less non-functional. I also recently added a hook and eye further in along the neckline just so I could get a straight boat neck (horsehair braid might have worked well, too, in hindsight), thus reducing any ‘showing off’ of my bra straps. The best part about making this dress was the fact that I didn’t have to do ANY hemming. You heard right, I cut the skirt bottom pieces on the selvedge so the edges were already nicely sealed, plus the border print was optimally left untouched. I think this occurrence of no need for hemming probably will rarely happen again in my sewing. Boohoo! In my photo shoot, I decided to go for the 1960s sleek French Twist hairstyle, complete with ribbon and vintage 60’s T-strap shoes. 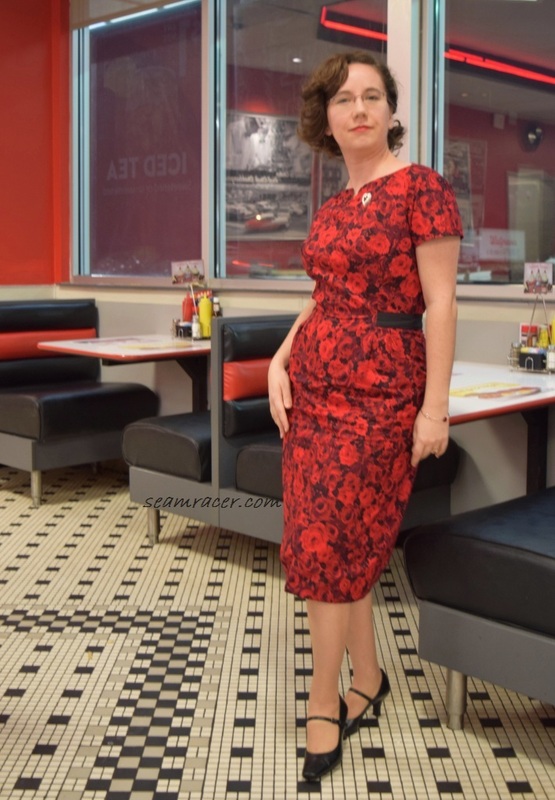 This dress IS from ’57 (late in the decade), and besides my hairstyle is merely twisting back in a different direction instead of being piled up into a beehive (‘B-52’ as it was nicknamed) hairstyle. Just the year before, in 1956, actress Grace Kelly made national headlines with her marriage into Monaco royalty, and the same french twist I did my hair into was popularized by Princess Grace herself right around those same years. Below are two pictures for the sake of fun and comparison: One is Betty from the TV series ‘Mad Men” and the other is my own ‘brunette Kelly’ imitation. 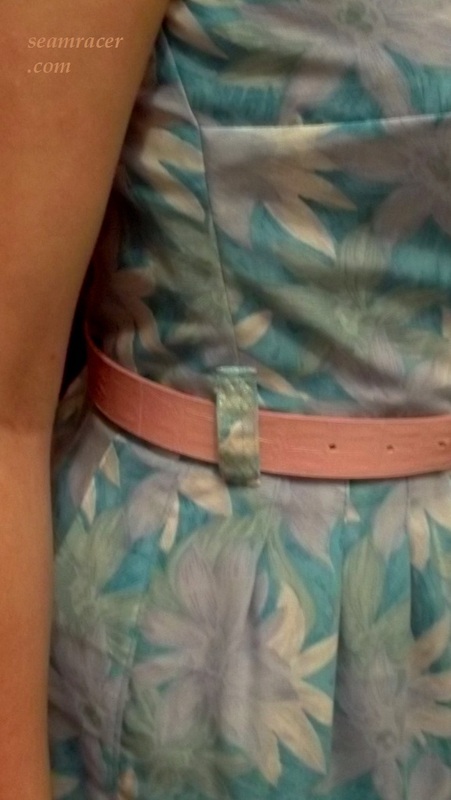 My dress is her favorite perfect pastel colors, at least! It’s a funny thing how I seem to get more looks from others with this ensemble than some of my modern dresses. Everyone I have spoken to recently has said how much they love vintage. 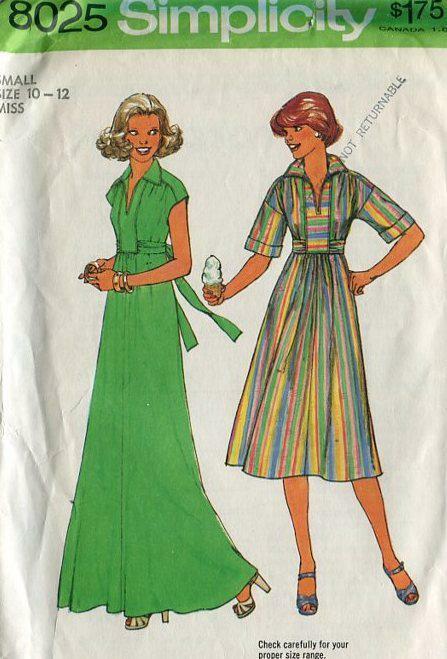 It’s so great to know that while being in style according to history, we seamstresses can also be in style via 2013! The best part is the fact that I saw a button shoulder top at K-Mart about a month later after I finished the dress last year. Not that I bought it, but when I see styles in the stores after I have made the same thing, it makes me feel ahead of mass market trends…in vintage. Ha! 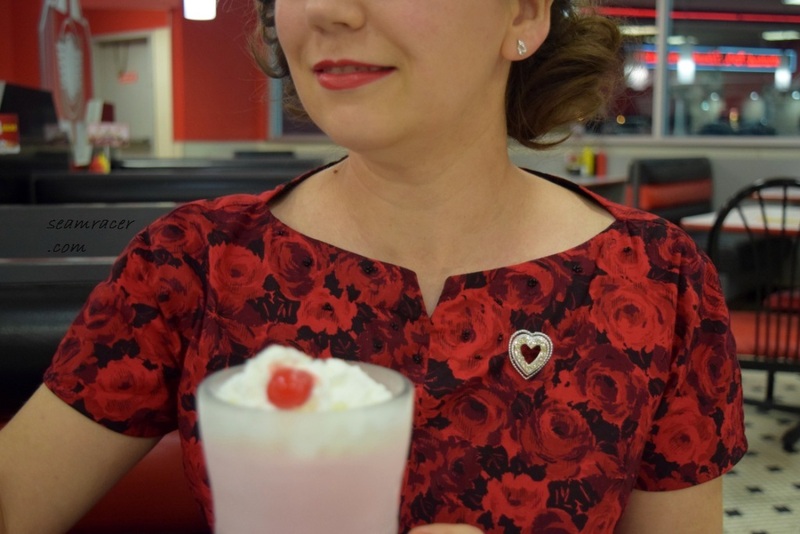 Keep up the vintage sewing and go proudly wear what you make!